A recent study published in Nature Communications is the first to report how a mature microRNA (miR-223) actively controls the gene expression of a cell in which it was not originally transcribed. 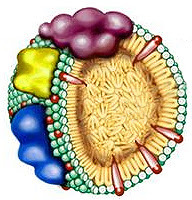 High Density Lypoprotein (HDL), commonly known as “good cholesterol”, is associated with reduced risk of cardiovascular disease. HDL particles are complex structures composed of many components, including proteins, bioactive lipids and… microRNAs. One of the known benefits of HDL is its ability to reduce inflammation that might integrate miRNA-driven pathways. Using primary Human Coronary Artery Endothelial Cells (HCAEC) and Human Umbilical Vein Endothelial Cells (HUVEC) obtained from Cell Applications, Inc., the authors discovered that miR-223 is not transcribed by the endothelial cells in response to HDL, but instead is imported by the HDL particles which pick it up from macrophages. These results decipher anti-inflammatory properties of HDL, and demonstrate for the first time, that mature miRNA can control gene expression in a cell in which it is neither transcribed nor processed. (1) Tabet F. et al. “HDL-transferred microRNA-223 regulates ICAM-1 expression in endothelial cells” (2014) Nature Communications 5, Article number: 3292. DOI:10.1038/ncomms4292. European researchers can now have access to a comprehensive offer of well-characterized primary cells (cryopreserved or plated) together with robust and sentitive miRNA profiling services (ex. 3D-gene profiling services by tebu-bio’s laboratories). If you are interested in sharing your experiments in these fields, feel free to leave your comments here!